Why do I need fresh air in my attic? How do I get more air through my attic? Passive ventilation is when your attic has no moving parts to force air either in or out. Active ventilation is when you have moving parts to force or pull air in or out of your attic. Typically, it is better to have an active ventilation system, but that really depends on the amount of air or cubic volume of airspace you have in the attic. 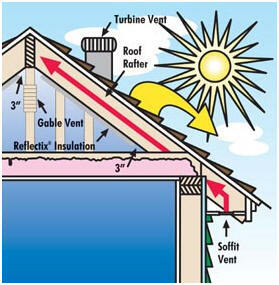 The most common way to increase airflow through the attic is to install some type of active roof or gable ventilation. This forces the air in your attic to move out through the roof or gable vents and be replaced by air moving in through the soffit/eave vents. There are a few different types of soffit vents. The most common are the large or small rectangle shaped vents on the overhang of the roof or the eve. Most builders use this type. Some homes will have continuous soffit vents that consist of a perforated board that is used to form the overhang. Still others will have the conventional eve design with long slits cut in, and a small mesh material to keep rodents out, covering the holes. We prefer to install the more conventional large or small soffit vents as they are the quickest, easiest, and least destructive type to retrofit into an existing home. Gable ventilation is only possible when a home is designed with gable ends. Most homes in the DFW area will have hip style roofs where the roof comes down and meets the house in every part of the home. When a roof has it’s own vertical wall or end, gable venting is possible. In situations, this is the best way to vent a roof that will accept it. It is not a good idea to add roof ventilation to gable style roofs without first covering the existing gable vents to ensure that air is not being pulled from the gable vents instead of soffit vents. 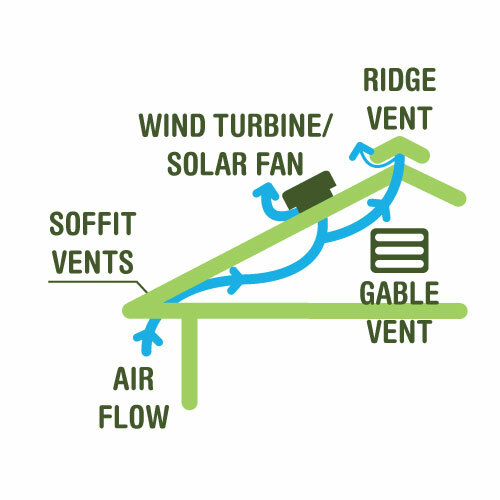 The existing gable vents can be supplemented with a regular or solar powered fan to increase the amount of airflow through the vent. Most homes will have either the large or small manual vents. These are basically covers placed on top of holes cut in the roof to allow air to move through the roof. These are all that is required when a new home is built. Remember that new home standards are not designed for energy efficiency. We do not offer the installation of these because we do not recommend them except in odd or extreme cases. Roof turbines or “whirlybirds” are a great way to economically increase the airflow through the attic. These usually replace existing manual vents on the roof and significantly increase airflow when compared to the standard manual vent. These are round in shape with fins cut all the way around them and turn when wind blows against them. They do not require electricity and are driven by the wind most of the time. They can sometimes be driven by the force of the hot air escaping from the attic, but that is not the principal way these are designed to work. Ridge vents are installed below the very top layer of shingles and are continuous from one end of the ridge to the next. These are not powered and have no moving parts but do allow for ventilation along the entire ridge of the roof. When the overhang of the roof has sufficient soffit venting, these will work great. Some homes are recommended to have this type of roof ventilation and some shouldn’t. This depends on the specific design of your roof. A normally powered fan is connected to your home’s electrical system and costs you money to operate. However, this is a great idea for attics with a lot of airspace. Regular powered fans will move up to 1600 cubic feet per minute which is about twice what a typical solar powered attic fan will move. These should always be installed with a thermometer that will turn the fan on only after the temperature in the attic reaches at least 95 degrees and set no higher then 110 degrees. In some situations, these will need to be installed as more of a requirement than an option so the attic will stay cool and dry. These are great for most attics. They do not cost any money to run as all the energy needed is received from the sun. Most attics will receive sufficient airflow from the installation of one or possibly two of these fans to keep it cool and dry. The upfront cost is slightly more, but you’ll save money in the long run by not having to pay to operate it. The solar cell is mounted directly on the roof facing south or south west. This allows for maximum sunlight on the cell when it is hottest out and keeps it running until the sun goes down. The solar cell itself is not a detriment to the aesthetics of the roof or house and most people will not even notice it. This is one of our most recommended options and is generally the best choice for most attics. To make your home more energy efficient, comfortable and save money on your energy bills, call us today about attic ventilation. Attic ventilation helps keep your home cool and dry. It removes moisture from your attic which may lead to mold and mildew. Attic ventilation lets your attic breathe. Why do I need fresh air in my attic or crawl space? To remove moisture or humidity from your Attic or Crawl Space, all year round. Which type of Attic Ventilation is best for my home? Since each house and attic are designed differently, faces a different direction, and has different qualities than any other house, there is no way to tell without actually seeing the house. Our energy experts are highly trained in all of our products and will be able to make the best recommendations for your home after a quick inspection of your home inside and out as well as the attic. For best results your Attic Ventilation should have a minimum of 1 large Soffit Vent per 100 square feet of home is recommended. Vents along the eaves and rooftop of your home creates a continuous flow of cool dry air to protect your home. Intake vents or soffit vents are installed along the eaves of the house to allow cool, dry air to enter the attic at the lowest point, which is pulled out at the highest point of the roof with exhaust vents. Wind turbines use the natural force of the slightest wind and/or air pressure from inside the attic to spin the air turbine and create a chimney effect venting out the stale, hot, humid air. Turbine vents are low-cost, and are highly effective at removing heat from an attic. Solar fans and electric fans are very effective as well. Remember, there’s absolutely no pressure to buy from us! Make your decision when you’re ready – financing is available if you need it.